The perfect solution for loading/unloading pallets. Application: A manufacturing operation processes a wide range of batteries that are used in the communication business. They commission and decommission hundreds of batteries a day. During that process, they are required to load and unload several pallets a day. Problem: The operators are manually lifting 140 pound batteries off pallets on the floor and move them to other pallets on the floor. Although these batteries were typically lifted as a team, the area still saw several low back strains from the bending and lifting. Solution: The desired result is to improve productivity by eliminating bending, reaching and stretching to place product on the pallet. To do that, we solved the problem with in two parts. The first part was to take away the bending. The pallets that are set up for loading and unloading were set on stands to keep the operator at a good working height. The next part was to take away the lifting or the wide range of batteries. This was accomplished with a vacuum battery lifting device. 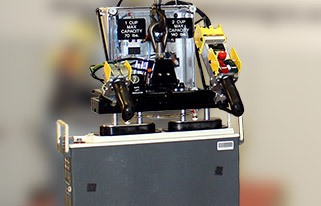 The vacuum lifter was integrated into a Gorbel Easy Arm. This battery lifting tool is a smooth zero gravity lifter that allowed for the precision needed to pick up the place the parts. To pick up larger parts weighing over 70 pounds, we used a two cup arrangement to get a 3 to 1 factor of safety. To pick up parts under 70 pounds, we used a single cup to get a 3 to 1 factor of safety. Since time was a concern, the heads were interchangeable to allow the operators to switch back and forth within 20 seconds. Results: Overall we were able to reduce the number of people needed to make a lift from 2 to 1 while decreasing the risk of injury while lifting. Contact Ergonomic Partners for assistance with your ergonomic applications. We solve problems!